Furniture from the American Arts & Crafts period is often misunderstood and misinterpreted. Many woodworkers assume that the deliberate lack of ornament means it is easy to build. One often overlooked feature is the visual effect of parallel surfaces that aren’t in the same plane. Instead of the front face of a cabinet as one continuous surface with molding applied at the top and bottom, Craftsman furniture usually has steps between one surface and another. Simplicity of form doesn’t mean easy construction, most often the opposite is true. 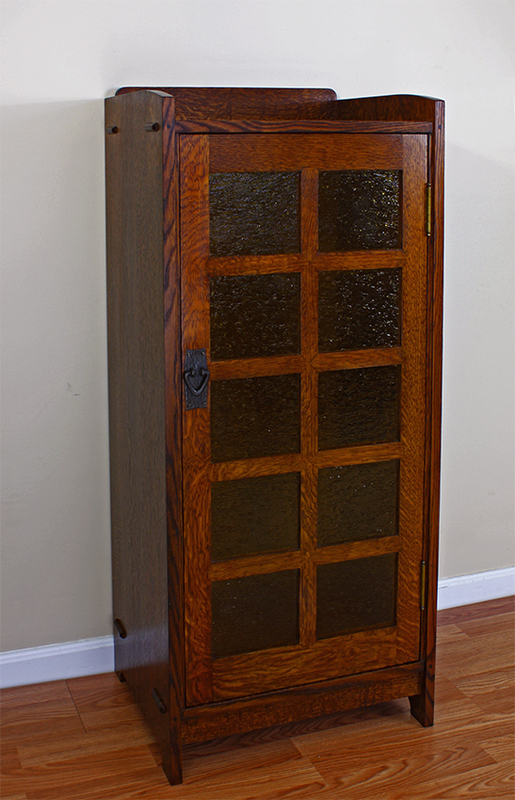 In this Gustav Stickley (my reproduction) music cabinet, the vertical edges of the case sides are foremost. The top and bottom are set back from those edges, and the door is set back again, as is the rail below the cabinet bottom. This creates shadow lines that draw the eye toward the piece, inviting a closer look. This is a subtle but important effect. It doesn’t have the dazzle of intricate applied molding wrapped around the case. The design relies on good proportions and careful execution. In other styles of furniture if you miss the mark while constructing the case you can hide that behind the trim. I thus clearly recognized the dangers of applied ornament and advanced a step from which I have never retrograded. I endeavored to turn such structural devices as the mortise and tenon to ornamental use; to employ them in such a way as to force them to give accent and variety to the outlines of the objects in which they occurred. He was referring to exposed joinery, but the same reasoning applies to offsetting surfaces; the relationship between parts becomes a way to present an apparently simple design in a lively and interesting way. 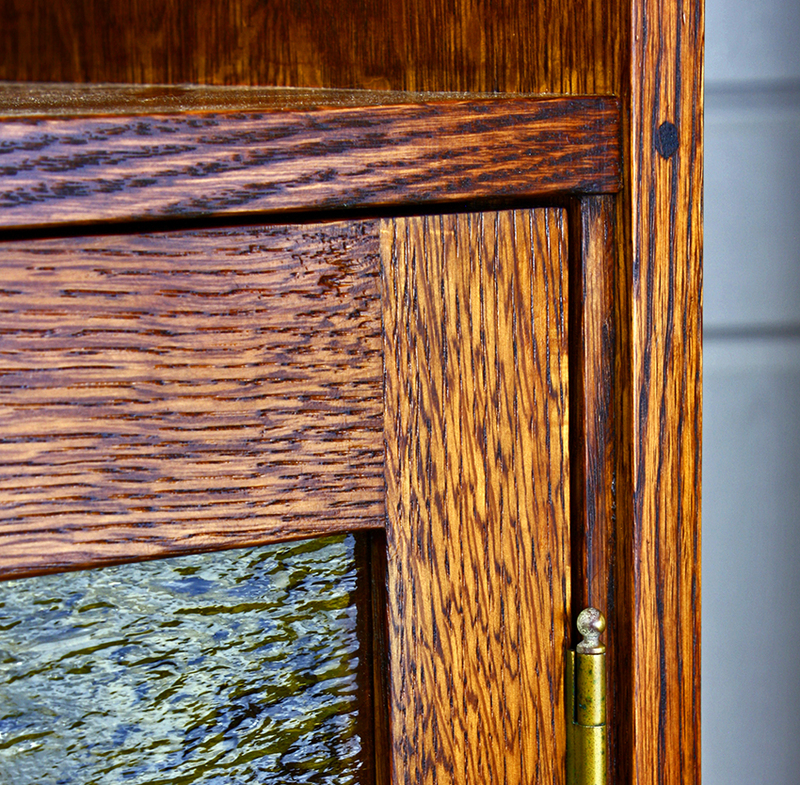 At right is a closer look at the corner of the door of my reproduction of a Gustav Stickley No. 70 Music Cabinet. 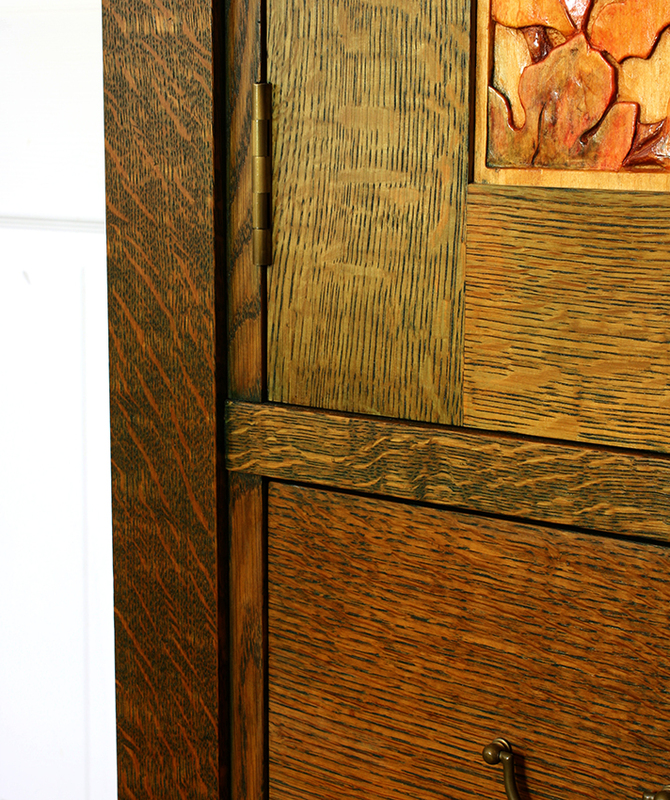 Between the door and the side of the cabinet is a strip of wood about 3/8″ thick. This makes it possible for the door to swing neatly and of course it is one more opportunity to offset adjacent surfaces. By the numbers, each of these offsets is 1/16″ back from the next surface. Just as the design goes back to basic elements, the successful execution of this work demands excellence in the basic tasks of making furniture. All of the pieces used in this composition must be as straight and square as possible, and the relationships must be consistently maintained. In the shop this means the ability to make parts exactly the size you intend them to be and to consistently place them precisely where you want them. Often in construction, the parts are aligned on the back surfaces. Instead of working from the outside in, you work from the inside out. The photo at left is my reproduction of the Byrdcliffe Sassafras linen press. This is near the center of the cabinet with doors above and drawers below the horizontal rail.The rail sits behind the leg, the vertical strips beside the door and drawer front are behind the rail, and the drawer front and door are behind those strips. Beside the door the vertical strip accommodates the hinge, and behind the scenes, attached to the lower strip, there is a wooden drawer slide that rides in a groove in the side of the drawer box. If you’re interested in the furniture designs of Gustav Stickley and other makers of the Arts & Crafts period you should check out my book “Shop Drawings for Craftsman Furniture”, now available in hardcover.